Granddaughter of Pioneer, Whipple Brown, One of Burners of Gaspee, Dead at Age of 90.--Had Letters from Many Presidents. Funeral services for Elizabeth W. Brown, granddaughter of Whipple Brown of Gaspee-burning fame, were held this afternoon from her home, 17 Planet Street. Miss Brown, who would have been 90 on Sept. 24, was the daughter of William Whipple Brown. Her grandfather, listed in the first Providence city directory issued in 1824 as a mariner, was one of the "conspirators" who burned the schooner. In that year the British Government had stationed at Newport a sloop of way and its tender, the Gaspee. This overt act, designed to enforce certain duty impositions obnoxious to the people of the Narragansett Bay region, was resented, and one day when the Gaspee in giving chase to a blockade runner ran aground, the citizens of Providence sallied forth and in the dead of night captured and burned her ere she could be floated off at high tide. Whipple Brown was one of the attacking party, and is even credited by some with having instigated it. Three granddaughters of the Revolutionary character have occupied the old homestead their lives long, until death has one by one removed them. Maria Brown is the only one left of the three. The old house, one of the most historic in the city, stands exactly as first built, over 200 years ago. Scarcely a detail has been changed. Its quaint back-yard garden, white-washed stone walls and contrasting architecture, together with the many antiques contained within, reminders of a bygone manner of living. have attracted antiquarians from far and near. The old family home has been tenanted by Browns continuously for four generations. The building itself is of historic interest because it originally stood in Pawtuxet, was in its early day a tavern there, and was moved to Providence by Whipple Brown on a scow almost two centuries ago. His amazing venture was derided at the time, partly on the score of an "impossible" undertaking, and likewise because the house was declared to be haunted. "It will be indeed haunted--by children" declared he, and he gave to the world eight of them. Elizabeth Brown loved the old place and spent all her life there. She was known as a woman of exceptional mental attainments having, friends say, the widest circle of acquaintances of any woman of her age in the city. She was a voluminous correspondent, and wrote letters in great numbers, including in her correspondents the very poor, persons active in business, politicians and statesmen. She many times addressed communications to various Presidents of the United States—and always got answers from them. Expires in House Where She Was Born in 1843 and Had Since Lived. Miss Maria Perkins Brown died last at the age of 91 in the house at 17 Planet Street in which she was born in 1843 and in which she has lived since. Funeral services will be held Monday at 12 o'clock in the parish house of the First Congregational (Unitarian) Church, successor to the church which in 1814 her father, William Whipple Brown of Revolutionary fame, attempted valiantly to save when fire broke out by organizing a bucket brigade from his nearby house. Miss Brown will be buried in the Brown family lot in Swan Point Cemetery. Miss Brown's capacity for friendship and her social talents made her beloved by a large circle of friends. Her house was the centre of hospitality. Every Saturday night for years she had entertained at a dinner party not for persons of her own generation or that immediately younger, but for young men and. women friends of this generation. She was the link binding them to the past, which she made vivid and alive through a fine ability for recital. History was made for Providence in the immediate vicinity of her home and of that history she could relate interesting chapters which she had seen written or which were told to her in her childhood by her father, one of the patriots who took part in the plot to burn the "Gaspee." The plot was hatched in the Sabin Tavern, next door to the Brown house and her father was said to be one of the instigators of the plot and one of those who helped bring it to pass. Often she told of the manner in which the house, once a tavern, was brought up the Providence River from Pawtuxet Neck after her father had taken it over for debts. Half of the house fell into the river on its perilous passage and the Browns always afterward delighted in telling that they lived in but half a house. The house in earlier days was in the heart of the social life of Providence. The Browns shared that life, numbering among their intimates the families who made Providence distinguished in the educational and industrial life of the country. With Miss Brown's death, the fourth generation of the family born in the house leaves it. The reporters from the Providence Journal assigned to the obituary beat, as cub reporters often are, were a little mixed up on their facts, but perhaps more because those family members retelling the story were likewise confused. Only the 1902 obituary for William Whipple Brown is accurate. The others variously gave credit to Abial's son and grandson for attacking the Gaspee. Note that Abial Brown of 1755 is the right age for the events, 18 years old, like known raider Ephraim Bowen and most of his 'youthful companions', as Bowen described them. Abial Brown's pension record #S21659 (spelt as Abial) is available on-line through the NEHGS at HeritageQuest, and lists him as being born in Attleborough, MA on April 25, 1755, and he died April 11, 1839, and that he had a wife, Lucy, at the time of his (late) pension application in 1839. He rose through the ranks from Private to Sergeant to Adjutant, but never received any written discharge paperwork. He was awarded his pension based on 2 months service, and the moneys were sent to a Benjamin Seawall of Providence, RI, probably his attorney. He first entered into service from Attleborough, MA and served variously in Captains Richardson, Dexter, and Samuel Robinson, Colonels Walker, Lippitt and Brown, and Generals Mercer, Sullivan, and others. He recalled he served in Captain Richardson's and Captain Robinson's Companies with two men named Jack Aldrich and John Howland. When he enlisted from Attleborough in May 1775 he was assigned to Captain Moses Richardson's Company of Colonel Timothy Walker's Regiment of Massachusetts Troops, and was stationed for eight months near Boston until his release date io December 31, 1775. In January 1776 he re-enlisted as a Sergeant in Captain David Dexter's Company of Colonel Christopher Lippitt's Regiment of Rhode Island Troops where he served out his time stationed in Rhode Island, New York, and New Jersey. In New Jersey, General Washington personally appealed to his regiment to re-enlist for an extra month, which most did, resulting in a total of 13 months service under Lippitt, when he was discharged. In October 1777 he was appointed and commissioned as an Adjutant to Colonel Chad Brown's Regiment of Rhode Island Troops, serving one month in that capacity in General Spencer's (?) Expedition stationed at Fireton (Trenton?). In 1779 or 1780 he was living back in Attleborough, MA and was drafted as a private into Captain Robinson's Company of Colonel Tyler's Regiment.od Massachusetts Troops stationed for two months at Bristol, RI for a total service time of 24 months. This was a long time in service compared to many men. There is an attached statement by his widow, Lucy Brown, dated September 1839 at which time she was 72 years old (birth year c1767) at which she claims to have been married to Abial Brown in July 1801 in the city of Hartford, CT, and requesting she be paid the arrears of his pension payments. There is also a statements of witness to the marriage by Lois Bigelow and Jonathan Horthorne indicating that Lucy's maiden name was Lucy Taylor, that the marriage took place at the second Congregational Church in Hartford, and that Lucy and Abial soon afterwards moved to Providence. The US Department of the Interior, Bureau of Pensions, in assessing Lucy's claim noted also that Abial Brown fought in the Battles of White Plains, Trenton, and Princeton. He had been receiving a pension of $96 per year under the pension act of 1818, which was increased to $100.89 under the pension Act of 1832. Unfortunately, no mention is made in the pension application material of his role in the Gaspee Affair. According to Rhode Island Pensioners, 1835 p805, Abial Brown apparently had his Revolutionary War service pension rescinded in 1821 because he had not been credited a total of nine months service in the Continental Line, but then he had it restored in 1828. Possibly, this was all due to inaccurate or incomplete paperwork. These records indicate he was of the rank of Private, and we know from family records he made Sergeant, probably would've been in the army longer than nine months to make that rank, and saw considerable service in many Revolutionary War battles. The RI Historical Cemeteries Database lists Captain Abial Brown as c1754-15 March 1839, buried at the Old North Burial Ground in Providence where the vast majority of Gaspee raiders are likewise interned. We note that Abial Brown was buried with the title of Captain, this probably referring to his nautical occupation rather than any attained military rank. Abial Brown went to Boston with the Rhode Island Militia, and participated in the battle of Bunker Hill, handling a musket in the skirmish. He afterwards enlisted as 3rd Sergeant in the Seventh (7th}Capt. David Dexter's Company of Christopher Lippitt's Regiment, which was ordered enlisted by the General Assembly of Rhode Island for one year, from 18th January 1776. In September, 1773, the Regiment marched westward after the disastrous action on Long Island, and joined Gen. Washington's troops in New Jersey. On the 31st of December, 1775, at Crosswicks, New Jersey, the Regiment at solicitation of Gen. Washington through Gen. Mifflin, volunteered. another months service beyond the 18th January, 1777, when their enlistment expired and participated in defense of bridge at Trenton, which successful defense, together with captures made Princeton, turned the tide of war in favor of the colonies. As proof that Abial Brown served through the campaign the pension stands as evidence, which Judge Benjamin Cowell obtained for him sometime subsequent to 1830; and every 4th of July he was paraded in the procession in an open barouch so long as health permitted. He lived at 17 Planet St. in the house now owned and occupied by myself, where he died April 11th, 1839. The following is a memorandum of the authority for the above statement. William Whipple Brown (my father) and Judge Benjamin Cowell's "Spirit of '76 in Rhode Island". Page 35, and Appendix B. It is interesting that Abial Brown's travels and actions during the Revolutionary War were remarkably similar to that of Colonel Daniel Hitchcock, and to Joseph Bucklin (V) who were both suspects in the attack on the Gaspee in 1772. Robert Perkins Brown (1850-1921) was the brother of Maria & Elizabeth Brown, and the son of William Whipple Brown to all of which we have the obituaries listed above. Left: An "open barouch", a form of carriage equivalent in status to the modern stretch limousine. The "open barouch" in which Abial Brown was paraded each July 4th is too similar to the "barouche" in which Gaspee veterans were paraded on July 4th, 1826 to be coincidental (see http://gaspee.com/EarlyCelebrations.htm written by Warwick historian Henry A. L. Brown, no relation to Abial). There were probably still too many Revolutionary war veterans around at the time to give them all such an honor. It's safe to conclude that the organizers of such parades were sticklers for historical accuracy, and would not have let Abial ride in the barouch unless he was, in fact, a Gaspee raider. Moreover, he would certainly not be welcomed by the other Gaspee raiders into the celebratory barouch if he had not deserved a place in it. While he probably was not in good health during the 1826 Independence Day Parade depicted in Henry Brown's article, he was undoubtedly at other celebrations in Rhode Island such as the Annual Bristol 4th of July Parade, which is the oldest continuing Independence Day Parade in the nation, since 1786. We see from family records that he was alive on July 4th, 1827, this was noted by the Providence Journal, probably because he was being paraded on that date at the age of 72. He died on 15 March or 11 April 1839, so Ephraim Bowen, as claimed, did outlive him as well as all the other Gaspee raiders. If we are crediting Abial Brown as being a Gaspee raider, some genealogical clarification seems to be in order on his exact lineage. A descendant of Abial Brown, Patty Meyer of Maine provided family records to clarify the history. We can ascertain that Abial (mistyped as Abiel) Brown was born April 26th, 1755 and died April 11, 1839. Birth records kept in the county seat of Attleborough, MA for the town of Rehoboth (and rediscovered courtesy of genealogist Marcia Briggs) show he was the son of Abial Brown (c1726-1821) and his first wife, Salley Bucklin. Since nothing further is heard from Salley Bucklin, and since Abial Brown of 1726 later remarried to her younger sister, we may presume that Salley Bucklin died shortly after the birth of her son, Abial Brown of 1755, and is likely buried in Rehoboth, MA. Abial Brown of 1726 was born in Rehoboth, MA (an easterly adjoining suburb of Providence now known as East Providence), and was reportedly to have been a millwright and a wheelwright. He subsequently married Abigail Bucklin (c1731-1808) of Rehoboth in 1760 they went on to have eight later children. Following customs of the time, this Abigail Bucklin was very likely the younger sister of his first wife, Salley Bucklin. From History of Providence County, Rhode Island, by Richard M. Bayles, New York, 1891, page 231: There was an Abiel Brown who was treasurer for the Town of Providence in 1770. Abial Brown (Sr.) died 18Aug1821 listed as Brown, Abial (ESQ.) and is buried in Cumberland, RI, as is his second wife, Abigail. The Esq. title probably came from his landed gentry status rather than that of a lawyer. As noted in the pension file above, our Abial Brown later married for a third time to Lucy Taylor in 1801 His son by Hopestill, Whipple Brown was a sea captain who married Betsy Pettingill (or Pettingale), and had offspring, one of which was William Whipple Brown (1814-1902). William Whipple Brown married Maria Perkins with who he had nine children, two of which were Maria and Elizabeth listed in the obituaries above, and one of which was Robert as listed in the article above. Confusion may be caused my the fact that the only Hopestill Whipple (1723-1793) discoverable via 2003 computerized genealogical files was married to a Nicholas Brown (c1720-1793) in 1744 and lived in Smithfield, RI, an adjoining town to Cumberland where the Abial Brown of 1727 lived. Furthermore, this Nicholas and Hopestill Brown had eight children, the last being an Abiel Brown born in 1760 who married a Polly. We don't know when Abial's (1755) wife, Hopestill died, but we can know that it was sometime between the birth of their ninth child in 1796 and Abial's later marriage to Lucy Taylor in 1801 (see pension evidence below). We might surmise that Hopestill Whipple was in some way related to Gaspee raid tactical leader, Commodore Abraham Whipple. So as to avoid even further genealogical confusion, there was another distinct set of Abial Browns in Connecticut. LDS search gives us an Abiel Brown b24 May 1754 but who, upon digging deeper, died in 1755 in Woodstock, CT -- so that's a dead end (sic), even though the father was also an Abiel Brown. On top of that, an Abiel Brown (presumably not of our concern) wrote: Genealogical history, with short sketches and family records, of the early settlers of West Simsbury, now Canton, Conn. There may also have been another pair of Abiel Browns in the North Kingstown-Exeter, RI areas around the time. We have not been able to establish any relationship between Abial Brown and the much more famous fellow Gaspee raider, John Brown and John's brother, Joseph Brown. We also have not been able to establish a relationship to George Brown, the lawyer that falsely denied knowledge of the meeting at Sabin's Tavern to plan the attack on the Gaspee. The Gaspee Days Committee proudly recognizes Abial Brown as a Gaspee raider, one of the select group of true American patriots. Right: Patricia Meyer, who sent along her family papers above, also gave the Gaspee Days Committee a family-owned gavel reportedly made from one of the floor joists of the old Sabin Tavern when it was torn down in 1891. The Brown family, who had lived next door for generations, were obviously aware and proud of the significance of the old building. During Gaspee Days Proclamation ceremonies held at the RI State House in May 2003, Abial Brown's descendant, Patricia Meyer, was formally 'indicted' for the treasonous crimes of her ancestor against King George III. Left: Abial & Whipple Brown "Half-a-House", sketch by Stephanie Concannon. On other points, the Providence Journal (Sunday, May 24, 1942) ran a short article about the sea-going house under "Funny Facts about our Rhode Island Forefathers". 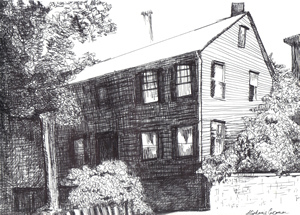 The Brown homestead at 17 Planet Street in Providence was next door to Sabin's Tavern, where the plans were laid to destroy the grounded Gaspee in 1772. This much storied Brown house was originally a house of ill repute in the old sea port of Pawtuxet Village, and was sold to pay off debts to one of the Brown family. 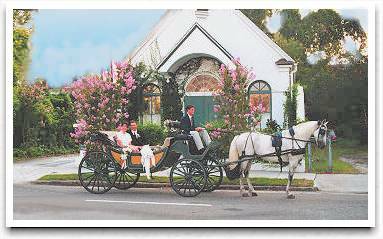 (We note that Abial's daughter had married a Charles Rhodes of Pawtuxet Village). To the amusement of onlookers, Abial Brown moved the house onto a barge and shipped it upriver into Providence. Along the way, half of the house collapsed into the Providence River, and the remnants were placed at 17 Planet Street. This move most probably occurred after the Burning of the Gaspee, as Brown family deed records show that Welcome Arnold, whose house is on the other side of the location, and which still exists, sold the plat to Whipple Brown in 1816 for $1800. Abial Brown did not grow up in this house, but may have lived in it prior to his death in 1839. Whipple Brown could have been so proud of his father's role in attacking the Gaspee that he moved his house next door to the place where the plans were laid. 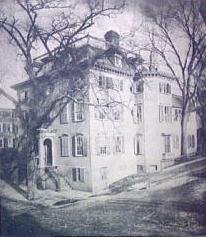 Alas, the Brown house no longer exists as of this writing (2002). We're not sure of when it was torn down, but it was later than 1931 photo below, and the site is now the upper parking lot for the law offices of Partridge, Snow, & Hahn.